I came across Stage Cosmetics while on holiday last year. It is a makeup brand positioned at around the level of say, MAC (but that's just the aspired brand perception, mind you). They have standalone stores with dark interiors that remind me of those of Make Up Store's but the set-up is more like backstage makeup studios, where one can get made up and/or made over. Stage prefers to call their stores 'retail studios'. Stage Cosmetics is a Malaysian brand that was launched sometime in 2008. It was created as a premium cosmetics brand by a local company known as Alliance Cosmetics that was then mainly involved in the distributorship of several international (drugstore) personal care brands (Revlon being their biggest score) in several countries in Southeast Asia. 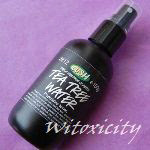 It also has an in-house budget-friendly drugstore brand called SilkyGirl. So, you could say that Stage is a huge departure from the norm in Alliance's portfolio. 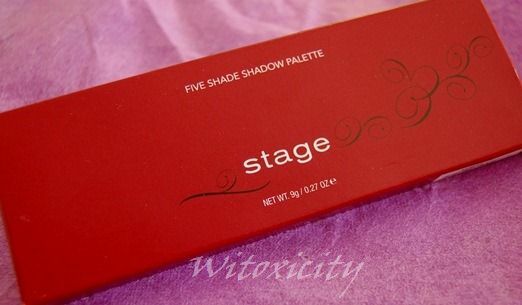 I bought three items from Stage, one of which was this Five-Shade Shadow Palette. There were altogether four palettes available and I chose the one with the most number of dark-ish shades (as I'm not terribly big on light shades). This one is called Gossip. The retail price was about the equivalent of €30 but I paid a bit less as it was on promotion. I like the plastic casing only for its scarlet colour and the lovely scrollwork pattern. The accompanying dual-ended brush is, as is usually the case, of not much use. The five colours according to Stage: Black, Maroon, Dark Green, Cocoa and Beige. ......and I think you'd be more inclined to believe me (photos are true to colour). 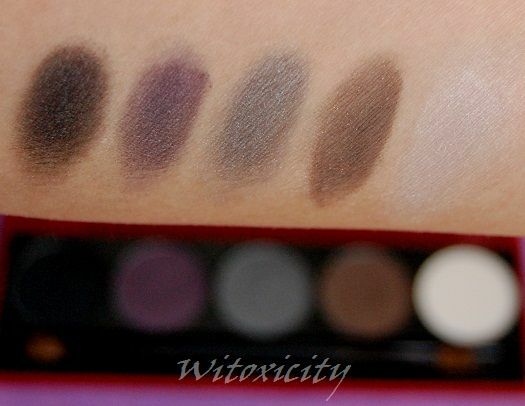 The pigmentation of these eyeshadows is average with the grey and the dark brown scoring the best. I thought the weakest in pigmentation were the black and the purple. Eyeshadow fallout wasn't too bad. Overall, this is an overpriced palette of average quality. The sales staff did say that Stage products are made in Italy but that's not enough to get me all wide-eyed. 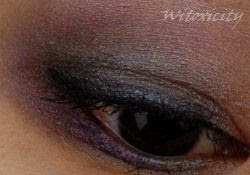 Nevertheless, I like the combination of colours in this palette, so I will be featuring a couple of eye looks with it. This one shown here is coming up soon. Love your eye look...will keep on the look out for your eye look posts. Seriously, I have seen this brand countless times, they have some really nice palettes (in terms of shades, bright shades for me). But I just am not inclined to purchase anything from it. Some of their mono eyeshadows have very pretty shades, and they do have BOGOF offer from time to time. I think I have only a mascara from Stage. LOL!